Astronomers think that there are enormous black holes at the centers of most, if not all, galaxies. These black holes, which can be millions or even billions of times more massive than the Sun, can greatly affect the galaxy and the environments around them. One way such black holes shape their surroundings is by generating powerful jets of high-energy particles. The jets, which are bright in radio waves, have been seen to push around the hot gas that envelops the galaxy. When this happens, astronomers can detect huge cavities and powerful shock fronts in the hot, X-ray emitting gas. However, the opposite scenario is apparently unfolding in the galaxy known as 3C442A. 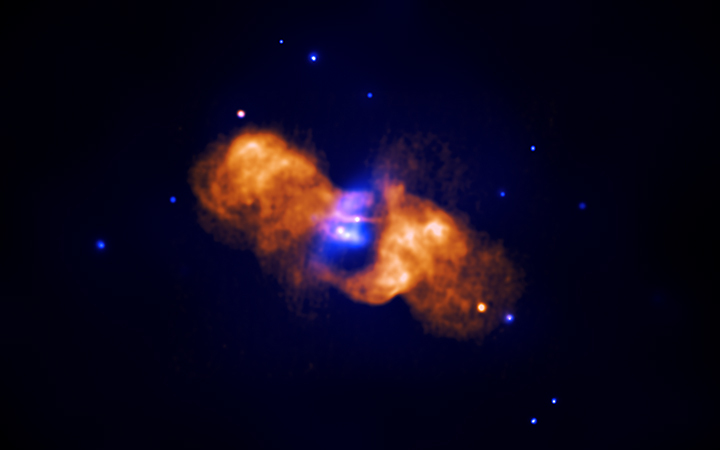 X-ray data from NASA's Chandra X-ray Observatory and radio observations from the NSF's Very Large Array show that the hot gas (blue) in the middle of 3C442A is pushing apart the radio-bright gas (orange). The inner sections of the radio structure are sharp and concave, which is consistent with the idea that the X-ray bright gas is sweeping the radio-emitting gas aside. This is the first convincing evidence for such a role reversal. A team of scientists, led by Diana Worrall of University of Bristol, UK, has studied this system and determined why the dynamics in 3C442A seem to be topsy-turvy. First, there are two galaxies near the middle of 3C442A which are in the process of merging. These two galaxies are on their second pass toward a collision, having already experienced a close encounter. 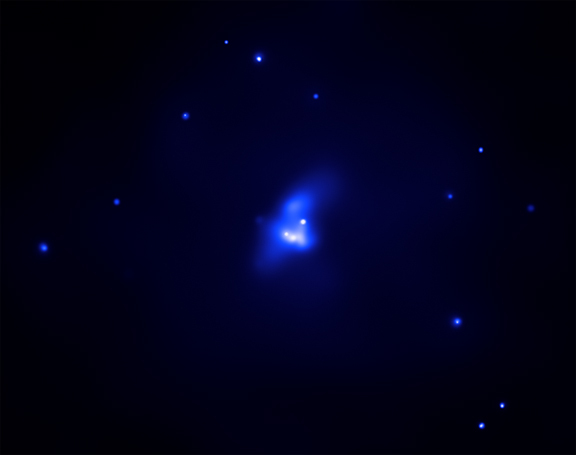 The energy generated from this impending merger is heating the combined atmospheres from these two galaxies, causing them to shine brightly in X-rays and expand. The researchers determined that the jets that had produced the lobes of radio-emitting gas are no longer active. The jets may have ceased at the time of, and possibly as a result of, the galaxy collision. Since the radio-emitting gas no longer has a power source, it is then at the mercy of the expanding hot gas and has been pushed aside. Coordinates (J2000) RA 22h 14m 47.00s | Dec +13 46' 16.00"